Yay for my very 1st blog giveaway ever! Here’s how to win a P1000 GC from none other than, Sophie’s Mom! 1. Follow my blog via Tumblr OR Bloglovin’ (check my right sidebar) OR Google Friend Connect (check my right sidebar). 2. Like Sophie’s Mom in Facebook and follow us in Twitter. 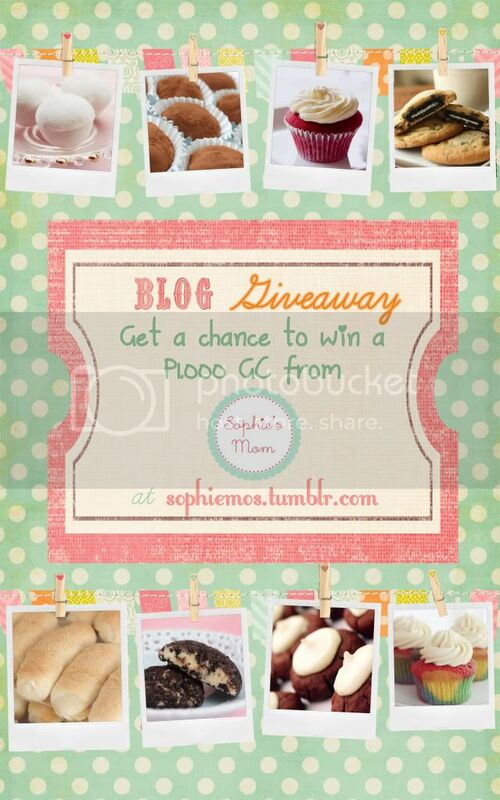 “Win a P1000 GC from @SophiesMomPH at www.sophiemos.tumblr.com!" *You must tweet BOTH. If you only tweet one, your entry will not be considered. +10, If you have a blog, copy this code to your sidebar. You can also increase your chances of winning by commenting again on this PHOTO: “I am going to the SuperSale Bazaar for the <insert your favorite goodie/goodie you want to try from Sophie’s Mom> of Sophie’s Mom! <tag the name of your friend>. You may tag as much friends you want! The more friends, the more chances of winning, since every friend is an additional entry! All entries will be checked so no cheating!